Beadles Glass: Kunstausstellung (Art Exhibition) - Oedt, Germany! Kunstausstellung (Art Exhibition) - Oedt, Germany! 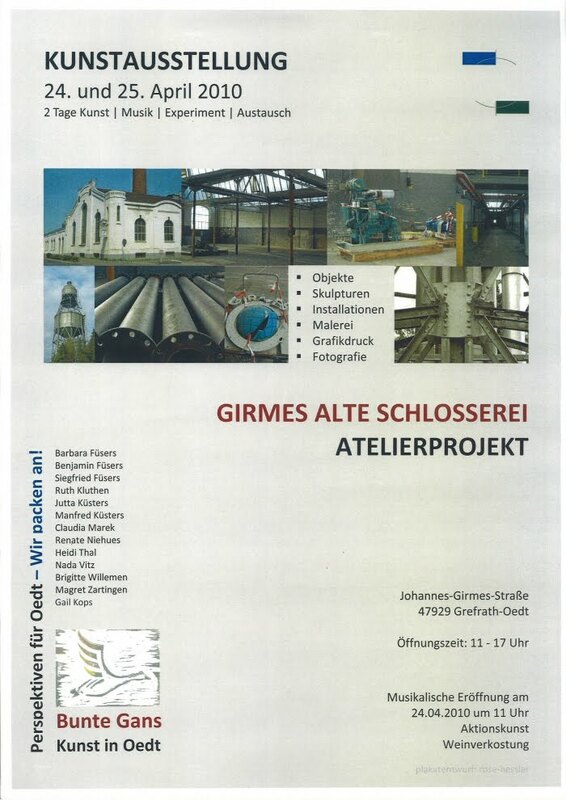 On the 24th and 25th of April, Beadles will be represented at the Kunstausstellung at the Girmes Alte Schlosserei (old maintenance department in the Girmes Factory), Oedt, Germany. The Bunte Gans (colorful goose) art group in Oedt has come together to create an expo of the diverse artistic talent in our small town. Included are painters, potter, photographer, sculpturer, an artist who creates icons (religious paintings), my glass, and more. I will be taking my torch for demonstrations and a few pieces of finished accessories to show. I'm not positive if others will be demonstrating their art forms or not but they will have finished creations on display. The old Girmes factory was a huge textile factory here in Oedt and they wove many sorts of fabrics and carpeting. It closed a few years ago and the buildings have been mostly empty. There will be music both days - the first day with music created on Hang (see this link for more description of the instrument: Hang Instrument), clarinet, and on Sunday will be performed by a group of drummers from Africa. The exhibition will run from 11:00 to 17:00 on Saturday and from 11:00 to 18:00 on Sunday. If you are in the area, please stop by and say hello! Sounds great. I hope there will be lots of visitors. Wish you lots of fun and potential customers.